Cedric Tai doesn't think Detroit is a blank canvas. (That controversial metaphor gets tossed around quite a bit these days by people who champion the city’s remarkable creative potential at the expense of its complex present and recent past.) The Detroit-born artist and Kresge fellow does think the city is filled with bad graffiti. To draw attention to the existing beauty of Detroit’s historic brick facades, and to prevent yet more graffiti from marring them, he facilitates the creation of stunning, colorful outdoor murals composed of what he calls “brixels.” (That’s “bricks” plus “pixels,” in reference to the blocky shapes they make, as well as the fact that they're originally generated online.) The community-created murals do more than that, though, as I learned when I pitched in to help create one in Woodbridge last weekend: They also bring people together, and let those of us who aren’t visual artists feel like we are, even for just a little while. On Saturday, Tai gave paper "keys" to the 20 or so people who showed up to the alley behind the gas station at Warren and Trumbull (the "keys" let us know which bricks to paint which colors). He also gave us a whole lot of spray paint and some very basic instructions. (There was good food and drinks, too, which made the unseasonable heat a little more bearable.) The next few hours’ collaborative work was fun and focusing, and, by the end, we'd created a beautiful piece of public art that gleamed in the afternoon sun. This was the fifth and final brixel piece that Tai himself will be organizing, as he hands over control to interested community members. 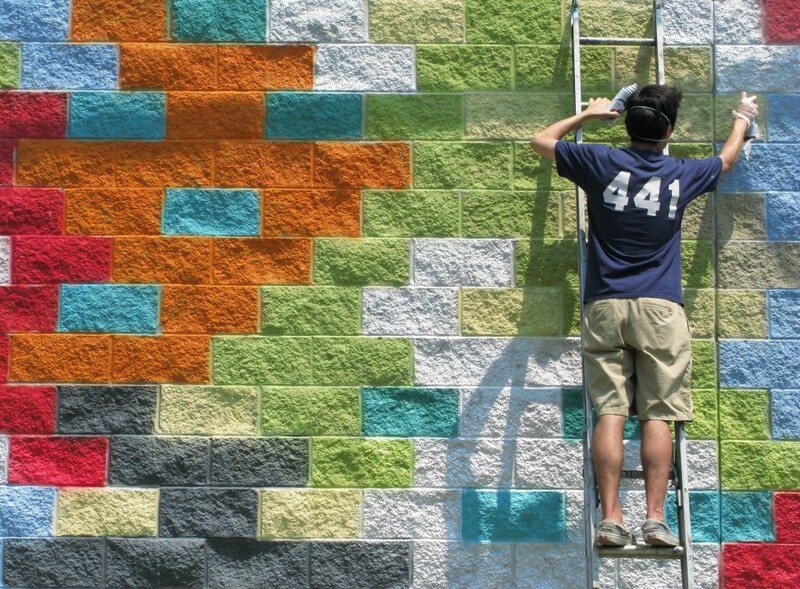 I talked with him over e-mail about his work, street art and the future of brixels in Detroit.